Simple to install, they are specially designed to be thrown, dropped or placed in the water by the homeowner and will automatically right themselves on the bottom facing the water’s surface. When the sun goes down the fun starts as the Deep Glow lights illuminate fish and marine life, as well as provide above water illumination for docks, bridges, and piers. This unique positioning can be useful for a smooth entry while returning from boating or fishing at night, while also providing an extra level of security after hours. The lights operate automatically with a timer or photocell, making them conveniently easy to use and enjoy. 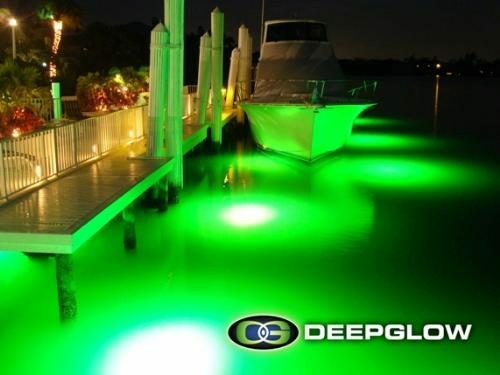 Additionally, Deep Glow lights are environmentally friendly using less power and providing more illumination than traditional above water dock lights. This is the perfect addition to any pond or lake, fill out our contact form, so we can better assist you. Patented Deep Glow lights were specially designed for both residential and commercial use and they perform under various settings. From harsh saltwater locations and rough water environments to calm lakes and decorative ponds, our lights consistently provide satisfaction for our customers around all over the world. Deep Glow lights are virtually maintenance free producing heat to combat marine growth and are easy to pull out of the water and clean, if necessary. The replaceable bulbs come in four colors and can be purchased from us directly. And finally, all Deep Glow lights come with a one year warranty. Deep Glow lights were designed specifically to solve the problems caused by the fragile designs of the past, some of which are still being sold today. 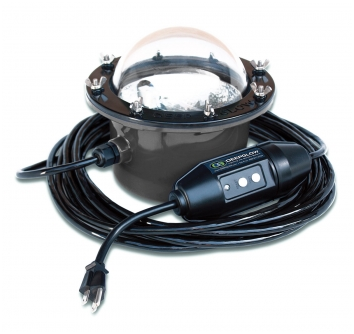 Deep Glow’s patented design utilizes a metal halide bulb in a tri-level protective casing constructed of a custom injection molded polycarbonate, waterproof and weighted housing, and 1/4″ thick glass dome. All include a one-year limited warranty that guarantees replacement or repair for any manufacturer’s defects at no additional cost. Deep Glow Lights are not only the toughest lights in the industry, they are brighter, easy to install and are well known for attracting fish. Deep Glow lights are up to 60% brighter than other underwater lights. By reflecting all of the available light towards the surface, we multiply the 10,000 lumens created by the metal halide bulb resulting in a much brighter appearance on the surface. Depending on water clarity and depth, our lights can illuminate a diameter of up to 30 feet. Deep Glow Lights are designed to be easily installed by the homeowner in just minutes without getting wet. Simply screw the grey box to the dock adjacent to your GFCI outlet and drop or throw the light in the water at the desired location. The light will automatically right itself and land on the bottom facing the surface. Now plug the cord into the timer (provided) and plug the timer into your outlet. When the sun goes down, the fun will start! Deep Glow products are environmentally safe and emit ultraviolet, colored light designed to attract and excite a variety of marine life. The lights begin to attract baitfish, which then attracts larger fish. As time passes, the fish become accustomed to visiting the light nightly since it produces a readily available food source. Deep Glow lights were designed and tested to withstand the rigors of harsh, rough, salt water environments and commercial applications. We designed our lights to withstand prop wash, wave action and even impact from cast nets. They are the lowest profile lights available, helping to avoid damage from outboard motor skegs and fishing lines. If you’re considering underwater lights for your home or business, be sure and choose a light that is built to withstand immersion and shock to provide you with years of enjoyment.